FlyFit earplugs feature special acoustic filters that help to block out the unpleasant noises during flight. These earplugs also regulate the air pressure during altitude changes. By regulating the flow of air in the outer ear, the inner ear has more time to adjust and the pain and pressure accompanying altitude changes are greatly reduced. Inserting FlyFit before ascent or descent will greatly reduce the possibility of ear pain caused by pressure change. Travelling can be tiring, especially if you’re on a long-haul flight. Being able to sleep in a noisy plane or a hotel room is invaluable and something not to be underestimated whilst travelling. However, it can be difficult to get the rest you need. Planes are a constant hive of activity, with the chatter of the passengers around you, the movements of the flight attendants, bored children, and a sea of mobile devices performing a thousand different functions. It’s not exactly the ideal environment for getting some much needed shut-eye. That’s why earplugs can help alleviate tiredness and jetlag whilst travelling. When you’re at home, you’re able to create an atmosphere of darkness and quiet that is conducive to sleep. This is what you need to try and replicate while you’re travelling, which is why the right equipment is essential. 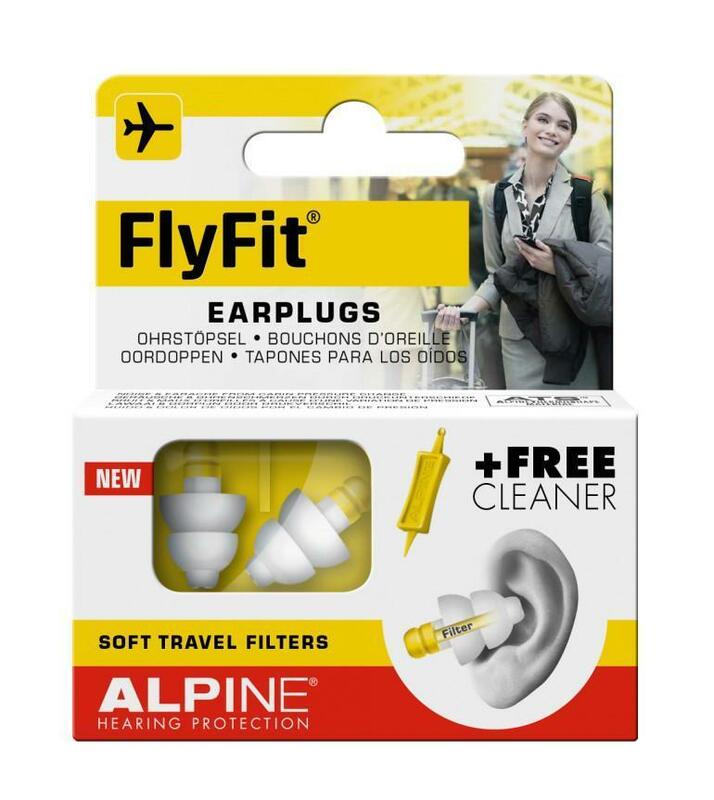 Bupa Travel Insurance Australia nominated Alpine FlyFit ear plugs for the article, ‘Survive a Long Flight with These Top Travel Accessories’. 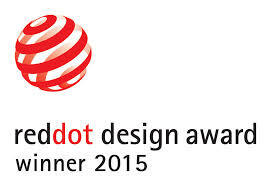 The jury of this prestigious design price applauded the “high quality and the innovative ability” of Alpine Earplugs. Alpine is now permitted to use the coveted quality seal on the Flyfit Earplugs. Twenty years of experience have allowed Alpine to develop a perfect new earplug model. 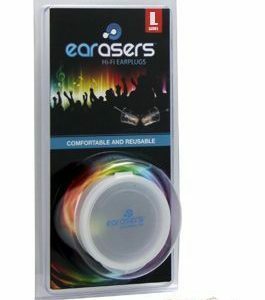 The extremely well thought-out and extensively tested shape of the earplugs, provides a natural flat absorption and a great fit. Plus the use of a special filter that only blocks the disturbing sounds. 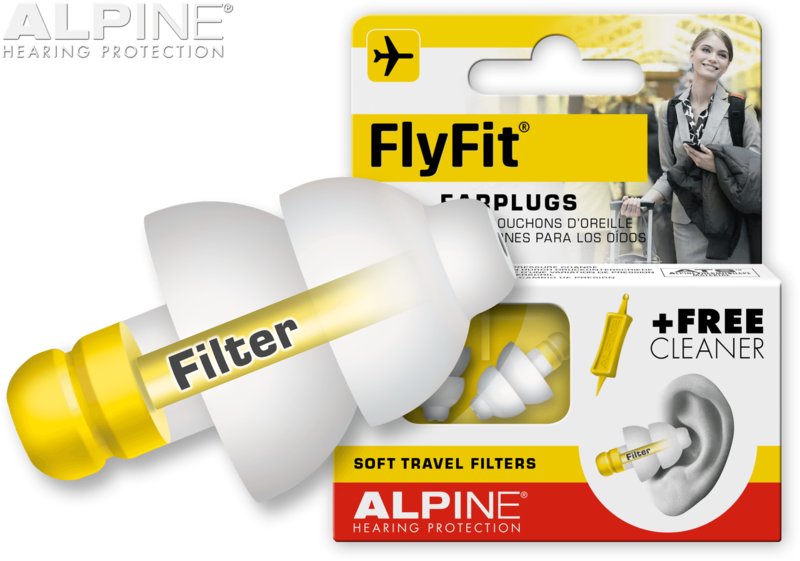 Alpine Flyfit earplugs have been specifically designed for flying comfort. 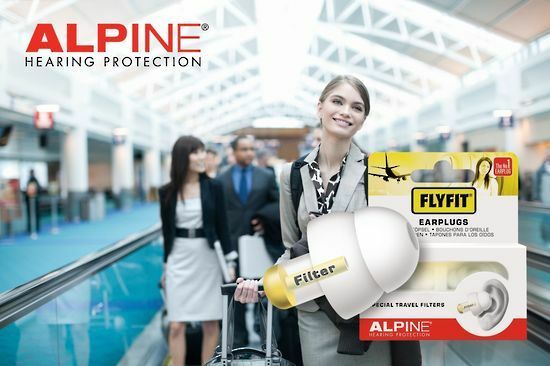 Alpine’s ear plugs do a fantastic job, not only at effectively decreasing the pressure on the ear drums during take-off and landing, but they also provide a great level of noise protection and extreme comfort. Ear Store works in close partnership with the world’s leading manufacturers of ear protection and sleep products, to offer the highest quality goods on the market, with many products specifically designed for comfort while travelling. Wearing FlyFit earplugs during flying regulates troublesome pressure on the eardrums during takeoff and landing. The filters operate like valves and ensure gradual and constant pressure equilibrium between the external environment and the middle ear. Thus, the Eustachian tube has sufficient time to acclimatise to pressure variations. In addition, the special acoustic filters in FlyFit earplugs offer protection against annoying ambient noise. The earplugs facilitate rest and relaxation during long flights, but are also very suitable for using during bus, train and car journeys. Alpine Pluggies Kids earplugs are available for children who experience earache during airplane travel. 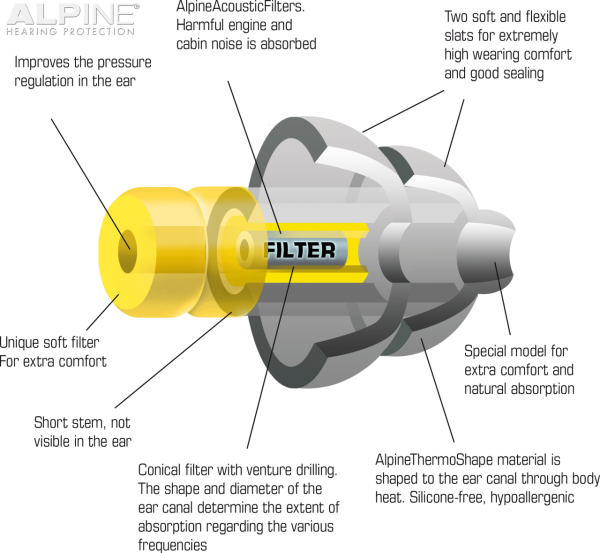 Alpine’s innovative earplugs are made from thermoplastic material specially developed by Alpine: AlpineThermoShape. This material adapts to the shape of the ears so that the earplugs fit the auditory ducts perfectly. 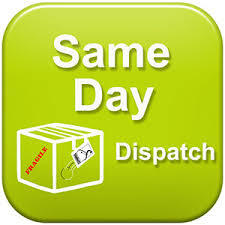 You are guaranteed a comfortable fit without unpleasant pressure on your ears. You are assured that the earplugs remain in the right position, thus providing optimal noise reduction. ATS contains no silicone, thus causing no allergic reactions. 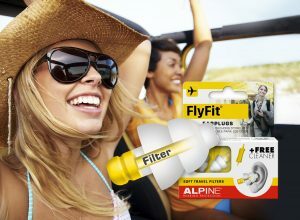 FlyFit and SleepSoft earplugs are the only earplugs on the market with soft, flexible filters. This ensures even greater comfort during your journey. With these soft filters, you can sleep soundly with your head turned to the side against your seat. Alpine has developed an easy-to-use cleaning tool to remove earwax from the earplugs. By keeping the earplugs clean, they keep working optimally and last longer. I consider my husband and I earplug connoisseurs, as we both wear many different kinds of earplugs for a range of reasons (light foam ones to cut sharp noises during sleep, heavier rubber ones to cut out all noise at work in an open-plan office, over the ear with built in headphones for commercial air travel…). I got these for my husband, who has to fly scientific research flights in which they fly almost every day for a month in long parabolas (i.e., constant and extreme pressure changes). He was starting to have some problems with his ears, and the doctor diagnosed mild barotrauma (i.e., ear damage due to pressure changes). He wore these on his first flight the other day and reported that his ears were good (I should note that he has also started a steroid nose spray, so hard to know what is responsible for the improvement). 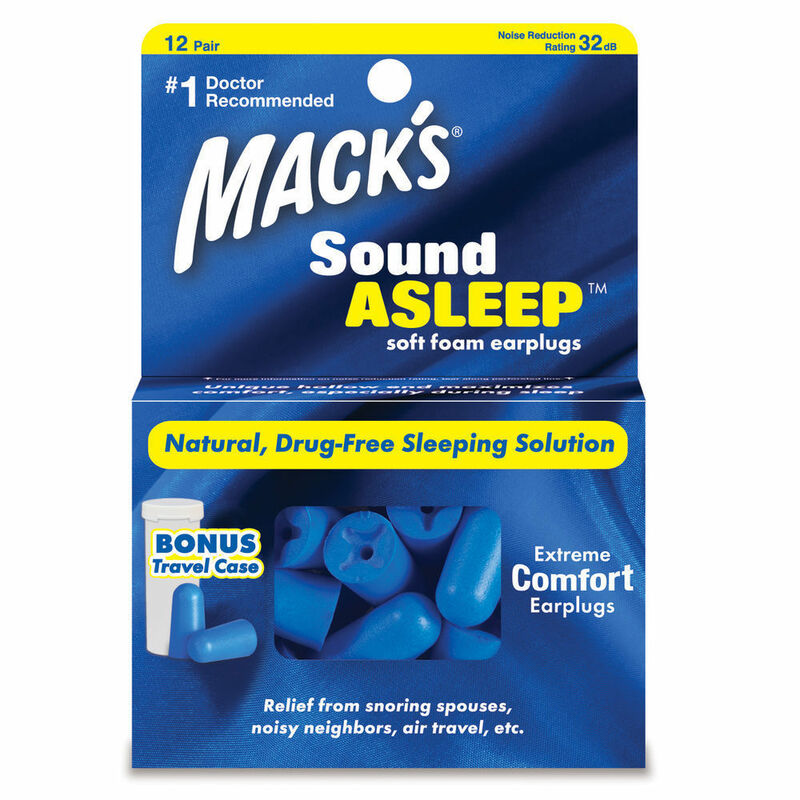 We both like that these are VERY soft earplugs, very gentle on the ear canal. They also have a very short “tail” that sticks out of the ear (it comes with a little wand to help you stick the earplug in), so you should have no trouble with over-ear headphones/ear protection, or with sleeping on your side. We will see how the rest of his research campaign goes, but if these continue to work out I will buy several more pairs. I can’t say enough good things about these earplugs. I have tried different brands and they all worked, but these worked the best. On my most recent flight, I had absolutely no ear pain! Seriously, without these I would had to think twice about getting on a plane. Tried these, since I had problems with three perforated ear drums and was thinking of not flying again, issues with pressure. I bought Alpine thinking this product probably won’t help me either but I read all the reviews first and decided to give it a try. I was pleasantly surprised and happy with the results. No hurting, no pressure issues and no more perforated ear drums. Do use these with gum, gum chewing is also the key to opening up your ear canals. You will be happy with this purchase. I hope this review helps all of you out there looking for relief. If you have trouble with pressure building while flying, you have got to get these. I flew for years and always went through the pain that came along with the pressure that would not release in my ears during decent. I purchased a couple sets of these plugs several months ago planning for a trip to Europe. Recently I took several trips and did not have the pressure. For the first time, I am able to enjoy the flight. I put them in before they shut the aircraft doors and felt the pressure releasing as we were climbing and descending. I didn’t have to chew gum or yawn to get pressure to release. Left them in the entire flight had no problem hearing what was going on in the cabin. These are the best and I completely recommend them to the highest degree. Finally I can travel again! I have Eustachian tube dysfunction in my right ear and had practically resigned myself to the fact that I would have painful pressure build-up, followed by fluid behind my eardrum any time I traveled by air. I tried everything: decongestants, both oral and nasal, and my ENT told me I needed balloon surgery to open up my Eustachian tube – a procedure not yet approved by the FDA in the US. On my last trip to Chicago, I ended up at Northwestern Medical Center in need of a myringotomy so that I could fly home a couple of days later. I decided a few weeks ago, before a mandatory trip back to Chicago, that I would order the FlyFit earplugs from the Netherlands and hope for the best. I was skeptical, but … God bless the wonderful Dutch! I flew both ways with virtually no problems. I inserted the plugs before the cabin door was shut and did not remove them until the cabin door was opened again upon landing. They were comfortable, I could still hear, and I didn’t look ridiculous with some foreign appendage sticking out of both ears. Now, I don’t know if this contributed, but after putting in the plugs, I covered my ears with a pair of earphones that had a snug, foam fit over both ears. On the way down, if I felt like any pressure was building, I lifted the earphones to discover time and again that I was fine. Had a wonderful trip. 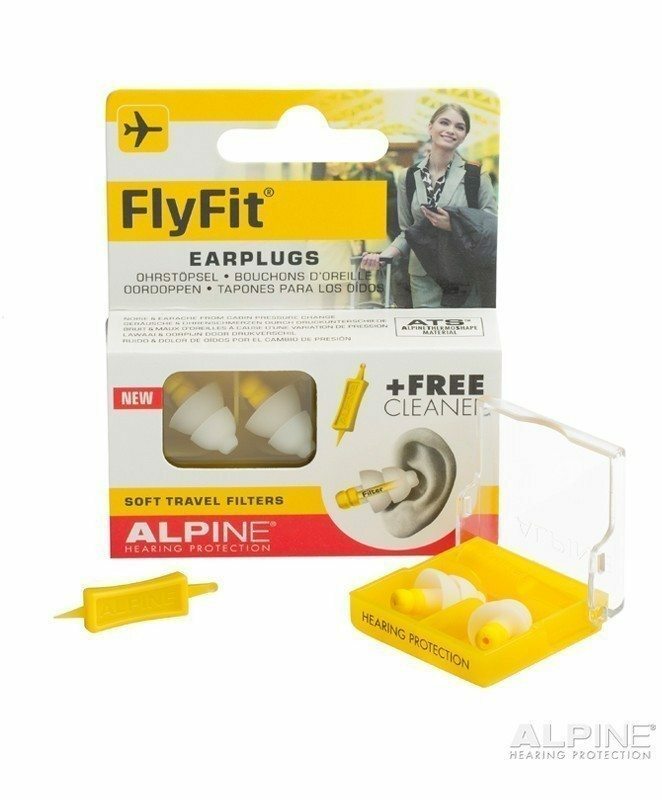 I highly recommend FlyFit earplugs if you suffer from ear pain and pressure. I know everyone’s physiological make-up is different, but I was an extreme case… and I am now excited again about air travel free of pain and post-flight surgery. Work great to compensate pressure differences. For testing purposes, I took them out of my ears during one landing, and I immediately had ear aches. Noise filter works relaxing as well. I’ve had trouble with ear pain while flying for a good 15-20 years. In the past, I’ve used a combination of Sudafed and Afrin to keep myself as decongested as possible, which does help with the pain, but never completely eliminated it. I decided to try these on a recent flight to New Zealand and Australia, in the hope not only that they’d take care of the pain but might also prevent the woozy sensation I get after long flights. My only complaint is that the case, which is perfect for the earplugs and the little applicator tool, doesn’t have room for the cleaning tool. I managed to lose that in no time even though I tried to keep it all together in a zip-top bag. I don’t know why Alpine doesn’t provide a case that holds everything. But that doesn’t diminish the fact that they really do help with ear pressure issues in flight. 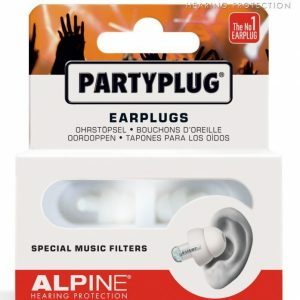 Alpine earplugs deliver on their promise. Much less pressure in the ears during take-off and landing of the aircraft and also very little other incidental noise … a peaceful flight is guaranteed. I travel/fly a lot with work, both nationally and internationally and I’ve not used earplugs before. A colleague recently recommended these Alpine FlyFit Earplugs to me. Considering they were relatively inexpensive I thought I’d give them I try. Now that I have used them I don’t know how I survived all those years without them for the plane and for the hotels. They’re great, looking forward to using them again.